Human rights violations remain systematic and widespread. But because they today occur on a smaller scale than in late 2015 and early 2016, they largely escape the attention of the international community. That is a mistake. The preconditions remain for mass atrocities. The trigger could be Nkurunziza’s apparent willingness to amend the constitution and run for a fourth term in 2020. The African Union, the United Nations, and the East African Community should work together now to compel the president to find a political solution to the conflict. The current political crisis was sparked in April 2015, when the former rebel group and now ruling party CNDD-FDD announced that Nkurunziza would run for a third presidential term. Despite opposition over the constitutionality of the move, Nkurunziza’s bid was confirmed in a controversial interpretation by the Constitutional Court. Nkurunziza was re-elected in July 2015 in polls that were deemed neither free nor credible by the UN. He now appears intent on consolidating and retaining power at all cost. This includes amending the constitution’s presidential term limits and the ethnic power-sharing quotas enshrined in the Arusha Peace and Reconciliation Agreement that ended the 1993-2005 civil war. Now Nkurunziza has hinted that he may run for a fourth term in 2020, arguing that the will of the people is “above the judiciary”. The government has authorised a commission to review the constitution, but none of its 15 members who were appointed in May have a background in constitutional law. Furthermore, the commission is under the direct oversight of the president’s office, raising concerns as to its independence. Its proposed draft amendments are expected by the end of the year. To long-term observers, the decision to review the constitution does not come as a surprise. The CNDD-FDD has never been a supporter of the Arusha agreement and refused to sign. It objected, inter alia, to ethnic power-sharing quotas between Hutu and Tutsi – the two main ethnic groups in the country. The constitution guarantees an ethnic balance of, at most, 60 percent Hutu and 40 percent Tutsi in both decision-making roles and within the public administration. The army too has benefited from an ethnic balance following the end of the civil war and has been seen as a stabilising force in Burundi. The army’s contribution to international peacekeeping missions has afforded Burundi both prestige and much-needed funds. However, according to a recent report by the International Federation of Human Rights, the army is now slowly being purged of Nkurunziza’s opponents, both real and perceived. These changes to the constitution and the army are dangerous. Burundi presents many underlying risk factors that, if triggered, could lead to mass atrocities. Burundi’s post-independence is replete with episodes of large-scale violence, which is one of the most reliable predictors of future mass atrocities. The state structures seem unable to counter human rights violations; the judiciary is tightly controlled by the government, and state organs – most notably the police and the National Intelligence Agency – are among the main perpetrators of violence. The CNDD-FDD’s armed youth militia, the Imbonerakure, appear to be ready and willing to escalate the violence. The Imbonerakure have already created a climate of fear and intimidation, referring to their opponents as “lice” and “dogs” and taking part in the human rights violations. Neither civil society nor a free media are able to counter these trends, suffering from severe restrictions and repression. It has become apparent that Nkurunziza has few scruples over the ethnicisation of the conflict. In the absence of his commitment to Arusha, a carrot-and-stick approach involving the African Union, the UN, and the regional East African Community may compel the president to the negotiation table to find a political solution. The AU initially reacted strongly against the deteriorating situation in Burundi. On 17 December 2015, at the height of the violence, the AU’s Peace and Security Council (PSC) recommended the deployment of 5,000 troops with or – if necessary – without the government’s consent. Many saw this as a realisation of Article 4(h) of the AU’s Constitutive Act, which allows it “to intervene in a Member State… in respect of grave circumstances, namely war crimes, genocide and crimes against humanity”. The PSC had hoped to force the government to the negotiation table. However, in light of Nkurunziza’s warning that any deployment would be met by force, the AU Assembly was split and ultimately did not endorse the decision. The AU has since withdrawn from engagement on Burundi. In its stead, the UN Security Council authorised 228 police officers in July 2016 to monitor the security situation. The government again refused and the decision has not been implemented. In September of the same year, the UN Human Rights Council mandated a commission of inquiry for Burundi, but the commissioners were denied entry. In light of the government’s refusal to cooperate with the AU and UN, when it meets to discuss Burundi this week the Security Council should impose asset freezes and travel bans against those who threaten Burundi’s peace and security. This decision would be in line with action taken by the European Union, the United States, and Switzerland, which have imposed targeted sanctions on a number of individuals. The EU has also suspended direct financial assistance to Bujumbura. The UN must also continue its contingency planning in case the situation deteriorates. It is currently “ill-equipped to mount the type of peace enforcement operation that may be required in the event of mass atrocities in Burundi,” UN Secretary-General António Guterres noted earlier this year. 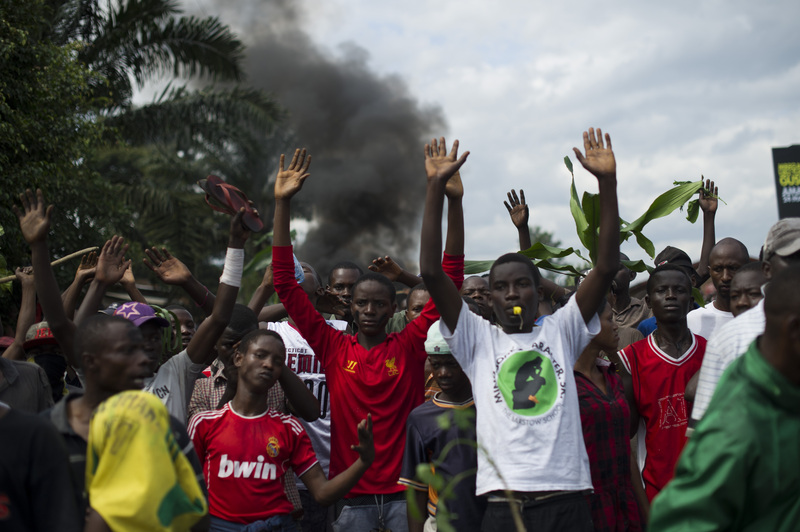 The Human Rights Council should suspend Burundi’s current membership during its next regular session in September. It is unconscionable that as a member of the council, Burundi refuses to cooperate with its mechanisms and fails to uphold the human rights of its population. The punitive measures taken by the UN will hopefully encourage the president and his government to re-engage with an East African Community-led mediation effort, which is trying to find a political solution to the conflict. While the talks appear to have stalled due to the government’s refusal to negotiate with the political opposition, a new round has been scheduled for later this month. Nkurunziza’s visit to Tanzania last week (his first trip outside of Burundi since a failed coup attempt in May 2015) to meet with Tanzanian President John Magufuli may revive the government’s commitments to the talks. Magufuli is thought to be one of the few regional actors with influence over Nkurunziza. As the crisis is inherently political, only a political solution can end it. However, it has become clear that the international community must compel Nkurunziza to find a negotiated settlement to prevent any further deterioration.